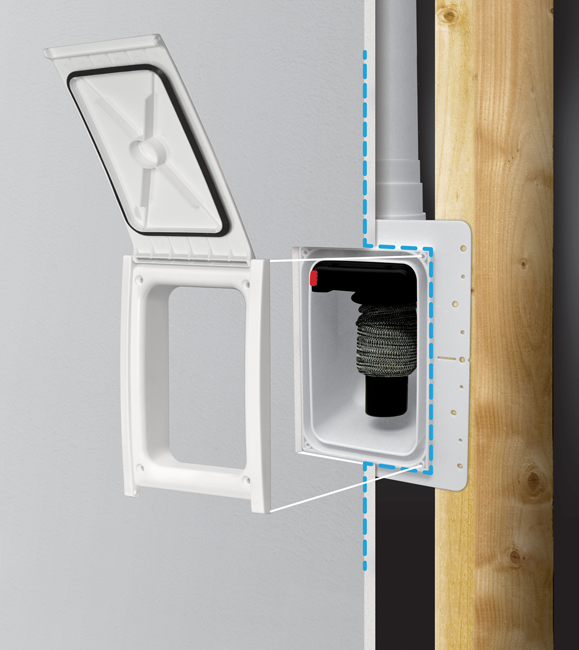 Retraflex is a central vacuum hose that retracts into the walls with the simple suction power of your central unit. No need of storage space for your hose. It automatically stores itself inside the piping system, right behind the inlet, with just the suction power of your central vacuum. A hose behind every inlet. Your central vacuum is always within your reach. You can therefore take advantage of its power to clean occasional dry messes in an instant! No hose to carry from inlet to inlet. The Retraflex is more convenient for quick clean ups than a traditional hose. Pull out just the length of hose you need and make it disappear behind the walls within seconds after your cleaning! Simply pull out the length of hose you need at the moment and connect the attachments of your choice. Pull on the black handle to start the system and to keep the hose from retracting. Push the handle tore lease the hose. Screw the inlet to the studs (America) or into the brick wall (Europe) and connect the piping system and low voltage wires. Once the wall is finished and the paint is dry, you just need to remove the cover plate (yellow) and put the door in its place. Then, all that’s left to do is adjusting the screws! Warning! The installation of the central vacuum and of the piping system must be done by a professional, in compliance with the manufacturer’s instructions provided with the parts. The material required to install the Retraflex in homes under construction is comprised of just one piece. Have a question or comment? Write us.